Most of our handmade dog treats are sent via Royal Mail 2nd class post unless it is otherwise stated such as the cakes, these will be sent either via next day delivery or 1st class Royal Mail. If your order is a large one we may use another courier, this is to keep the cost down for you. We can send to any delivery address, just input the address at the checkout. When you place an order you will receive an email advising when your parcel is to leave the bakery so you know that it is on its way. Please ensure your delivery details are correct as incorrect addresses can cause a delay resulting in the freshness of your order being compromised. If the you miss the delivery it is your responsibility to collect it from the depot or re-arrange the delivery. We cannot accept liability for the non-delivery of products or delay in delivery in circumstances beyond our control. If products are damaged once they have left the bakery through no fault of our own we will not accept responsibility or liability, also if the parcel is not collected from the depot/courier promptly will not accept responsibility/liability. It is important you collect promptly as our products need to be stored in the correction conditions & some have limited shelf life such as cakes & Training Treats. We do of course offer local delivery if you are within a 10 mile radius. Please contact us prior to ordering if you think you may be within this area. It’s always worth asking as we may be out in your area on a particular day. All shipping charges are calculated at the checkout stage, this will depend on the weight of your order and method it needs to be delivered. We aim to dispatch your order within 3-4 days with the exception of our personalised goods however there are certain times of the year when we are incredibly busy such as Christmas, please allow 7 days at these times. All our products (*except cakes) are sent via Royal Mail 2nd class delivery, this means to allow 2-3 days for delivery. If you require your order quicker than this ,please contact us & we will do our best to accommodate your needs. Our cakes are sent via next day delivery, this is to keep them in the freshest condition for your pooch. We aim to get your order to you within a week, however at busy times this may take a little longer so please allow plenty of time when you order around these times. We currently only deliver to the UK and Ireland. Millie & Ruby’s only take payment via Paypal or if delivered in person cash. We do not hold your card/bank details or even have access to them. Our subscriptions are also run through Paypal so we cannot view the details of your account/card. We are committed to keeping your private data secure & will never share your details with anyone. We do not disclose to any third parties in accordance with the Data Protection Act 1998. When you place an order with Millie & Ruby’s PayPal will send you a confirmation of payment email, you will then receive an email from us advising when your order is to be despatched. 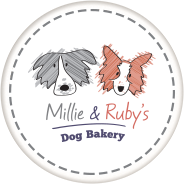 At this point if there are any issues with your order please let us know, this email will then be considered a binding agreement between you and Millie & Ruby’s. A lot of effort & care goes into making our products and the service we offer. If you are not entirely happy upon receipt of your order please email us or contact us using the form on our ‘contact us’ page. All of our goodies are handmade and may vary slightly. Everything is however inspected prior to leaving the bakery and is packed very carefully so they reach you in the best condition. You may return any item for exchange or refund *except personalised items. This must be within 14 days of receipt, and unless faulty, damaged or incorrect we will not refund the postage. We will also only issue a refund once the goods have been received back at the bakery in its original packaging. Should you wish to return an item it is always advisable to obtain ‘proof of postage’ and returned via their Signed For service. The bakery accepts no responsibility for returns lost in transit. All of our products will arrive with a sticker detailing how they should be stored & what their ‘use by’ date is but as rule of thumb our biscuits should be kept in airtight containers & our cakes in the fridge but please see each individual item for specifics. As with all our products they should only be fed as a complimentary pet food and fresh drinking water should always be available. Here at Millie & Ruby’s we are passionate about what we feed our pets. In fact this what prompted our business as Ruby requires a special diet. If you cannot see a product that would suit your specific requirements please contact us as we may be able to help. always use the low fat alternative. Our meat is trimmed of any fat. We don’t add any salt, sugar, preservatives, artificial colours, additives or flavourings. We do not add bad fats to our products & only use coconut oil in our recipes which has loads of added benefits to your dog’s health. We will always use organic ingredients where possible & our eggs are free range.